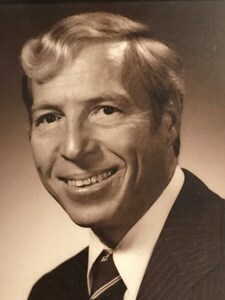 Charles Edward Hunt (“Charley”), 82, of Olathe, passed away on April 1, 2019. He was born on December 12, 1936 to Charles and Ruah (Lyerla) Hunt in Cape Girardeau, Missouri. Charles grew up in Cape Girardeau, Missouri and moved with his family to St. Louis, Missouri. He attended college at Harris Teachers College and received an Honorable Discharge after serving in the United States Navy for three and one-half years. Charles met his loving wife, Beverly, at Arthur Murray Dance Studio, where they taught ballroom dance for several years. They were married on November 14, 1959, by Beverly’s father, the Rev. Paul M. Bolman, Th.D., at Hamilton Christian Church in St. Louis, Missouri. After his service in the U.S. Navy, Charles had a distinguished career as a salesman for computing and telecommunication services. He was honored as Salesman of the Year by Automatic Data Processing (ADP) in 1974. Charles and Beverly moved their family to Olathe, Kansas, in 1977, where they continued to make their home. In June 2011, Charles was honored by the Grand Lodge of Missouri for his service of 50 years as a Master Mason. He was also a Shriner, having served in the Drum and Bugle Corps during his time in St. Louis. Charles was active in Lion’s Club International, having recently served as President of the local club in Overland Park, Kansas. He had a love for fishing and adored spending time with his family. Charles is survived by his wife, Beverly Hunt; children, Kim (Bob) McKeighan and Dana (Christy) Hunt; grandchildren, Brian McKeighan, Brendan (Kelly) McKeighan, Tyler Hunt, Aubrey Hunt and Alden Hunt; and great-grandchildren, Ivy McKeighan and June McKeighan. He was preceded in death by his father, Charles A. Hunt, and mother, Ruah B. Lyerla. The family will receive guests for a visitation from 6:00-8:00 p.m. on Tuesday, April 9, 2019, at Penwell Gabel's Olathe Chapel. A funeral service will be held at 1:00 p.m. on Wednesday at The United Methodist Church of the Resurrection - Wesley Covenant Chapel (Building C), 13720 Roe Avenue, Leawood, KS 66224, with a reception following. To leave a special message for his family or to share a memory of Charles, please click on the "Share Memories" tab above or scroll down below. Add your memories to the guest book of Charles Hunt.